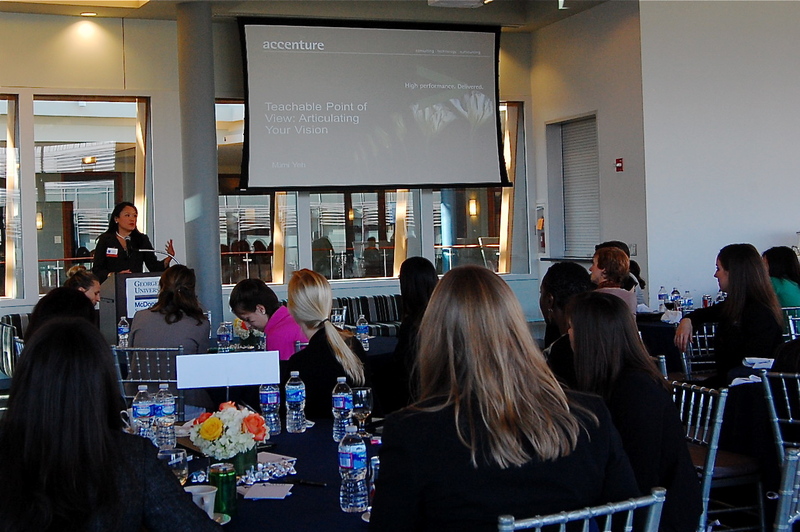 The 2013 Georgetown’s Annual Conference for Women in Business was a huge success! Guided by a theme of “Leadership Through Influence: Tipping the Balance in Your Favor,” the day included two separate executive keynote speakers, specialized workshop sessions on “Personal Branding” and “Smarter Spending,” an afternoon panel on “Conveying Power,” and introduction and closing remarks by two of our most accomplished female faculty members. 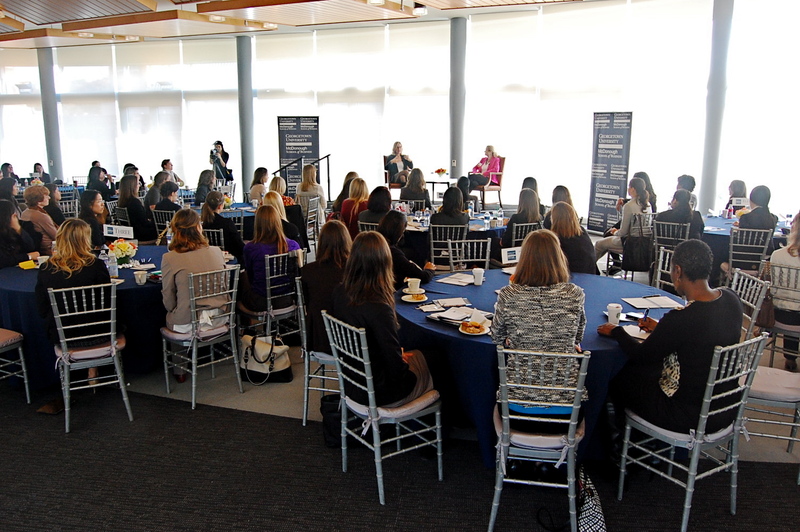 The event attracted over 100 attendees, including current GWiB members, alumni, prospective students, faculty, staff, other Georgetown graduate students and leaders from the community, all who had ample time to network throughout the day. Amy Celep, Chief Executive Officer, Community Wealth Partners; Annette Grimaldi, Managing Director, BMO Capital Markets; and Joy Malbon, Correspondent, CTV News (Canadian Television), in Panel moderated by Elizabeth Griffith, Senior Associate Dean, MSB. 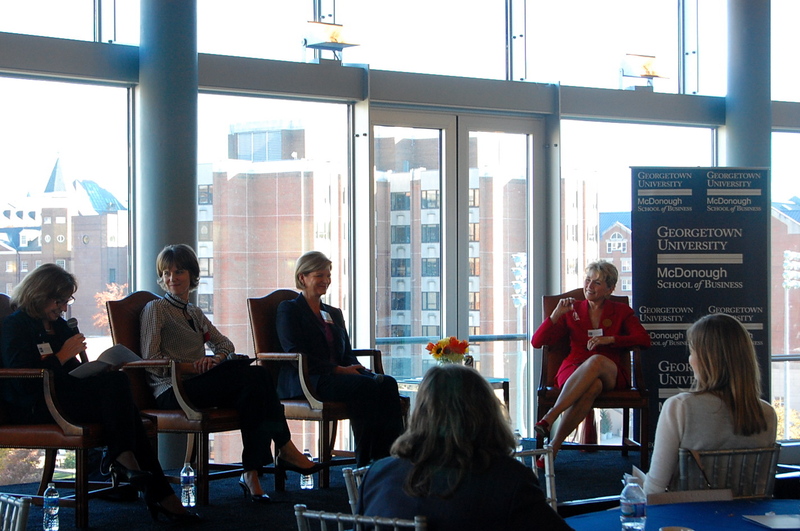 “I very much enjoyed hearing the unique viewpoints of powerful women in business. The individual stories that each of our speakers and panelists shared created valuable personal insight into their career history. Their unique perspectives on issues of women in the workplace were extremely timely, and having the personal connection through their viewpoint made the day even more rewarding.” Rebecca Newberg, MBA candidate. 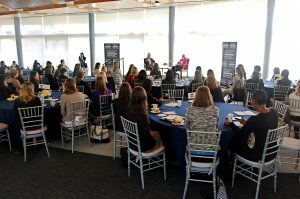 “Georgetown’s Annual Conference for Women in Business provides a unique opportunity for women to come together and think about who we are, where we are going, and how we are going to get there. To that end, the Conference focuses on utilizing research to craft a provocative agenda, developing skills through researched techniques and workshops, and building a stronger community through ample networking opportunities. It was a great and inspiring day!” Kristen McGrath, MBA candidate.